LENNON, John The Penguin. (John Lennon in His Own Write. A Spaniard in the Works). (Harmondsworth), Penguin Books, (1968). Original wrappers. 160 p. Illustrated by John Lennon. Reprint. Spine and upper cover partly discolored. Upper cover partly detached. 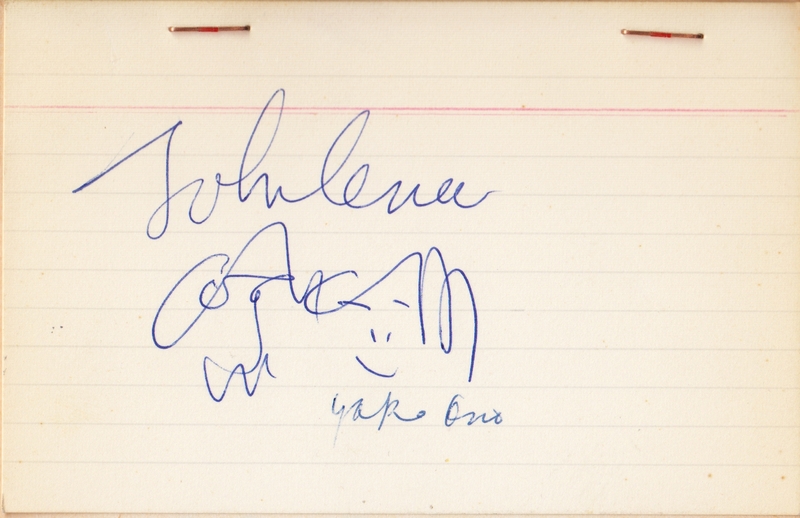 * With an original signed drawing by John Lennon and the signature of Yoko Ono, in ballpoint pen on a card stapled onto the halftitle. It shows the well-known caricature of a bespectacled Lennon and smiling Ono. 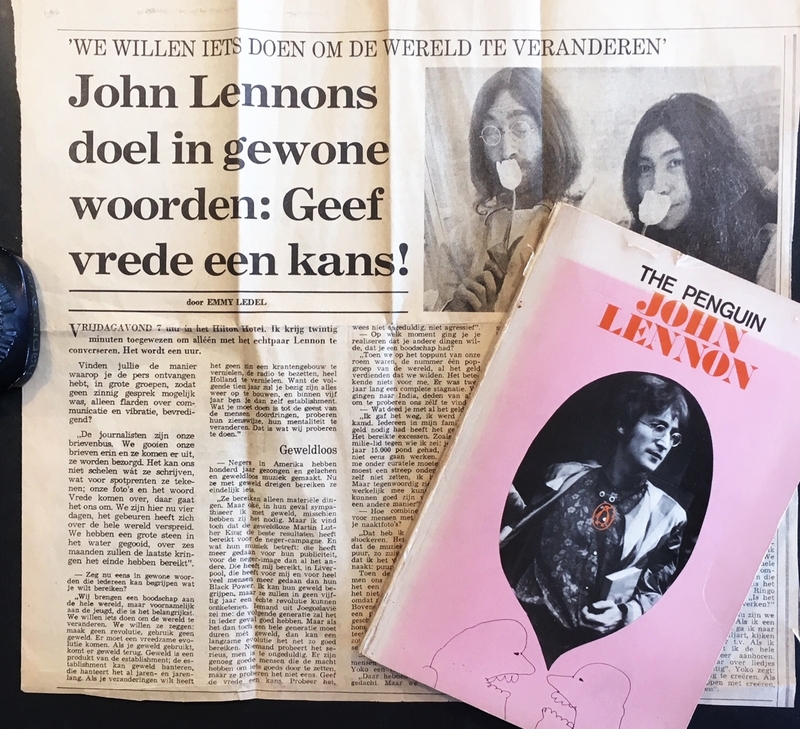 Drawing and signatures were obtained on March 28, 1969 by eleven-year-old Lorenzo Ledel, who accompanied his mother, Dutch journalist Emmy Ledel-Huf (1922-1992), to her interview with John Lennon and Yoko Ono during their legendary Bed-In for Peace in the Presidential Suite at the Amsterdam Hilton Hotel. Ledel-Huf’s extensive interview was published in the local newspaper Het Parool (original newspaper clipping inserted in the book). Young Lorenzo Ledel, sitting on the edge of the bed of the world famous artists, obtained a total of ten signed cards. The next days, he sold these to his classmates for one guilder each. This is the last surviving card and the only card with a drawing. The large original drawing that Lennon gave to the boy on the same occasion has been lost over time… A very appealing relic, reminiscent of a great happening. We presented the book with the drawing for the bookfair in Amsterdam in September, attaining a lot of attention, including newspapers and teletext, and it was even broadcast in the six o’clock national television news. You can see this here – including enthusiastic 59-years-old Lorenzo Ledel himself (and us). 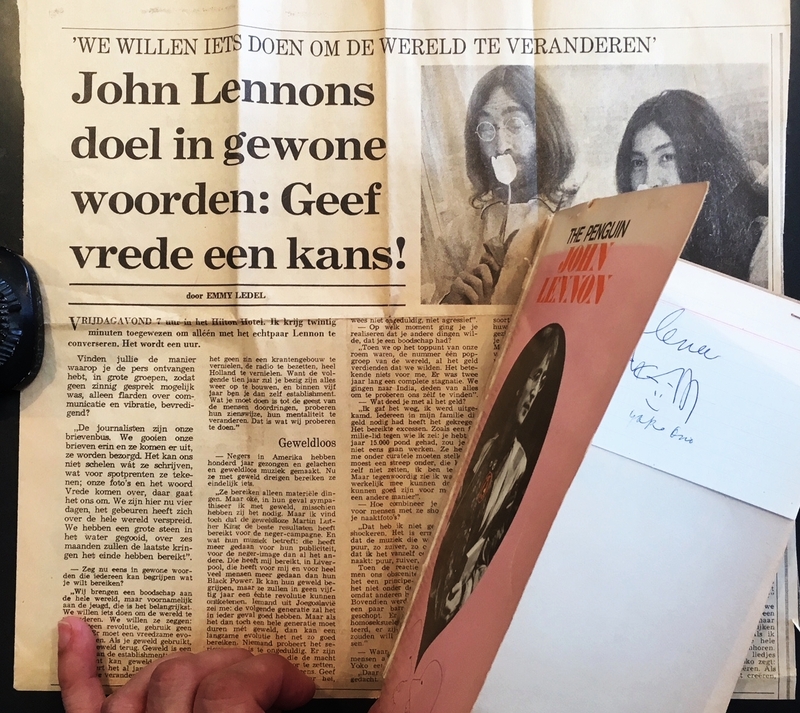 And John & Yoko, the white Rolls, the Amsterdam Hilton and its broad sunny bed, and John signing, drawing and talking to Ringo on the phone whilst opening an airmail letter with his toes. 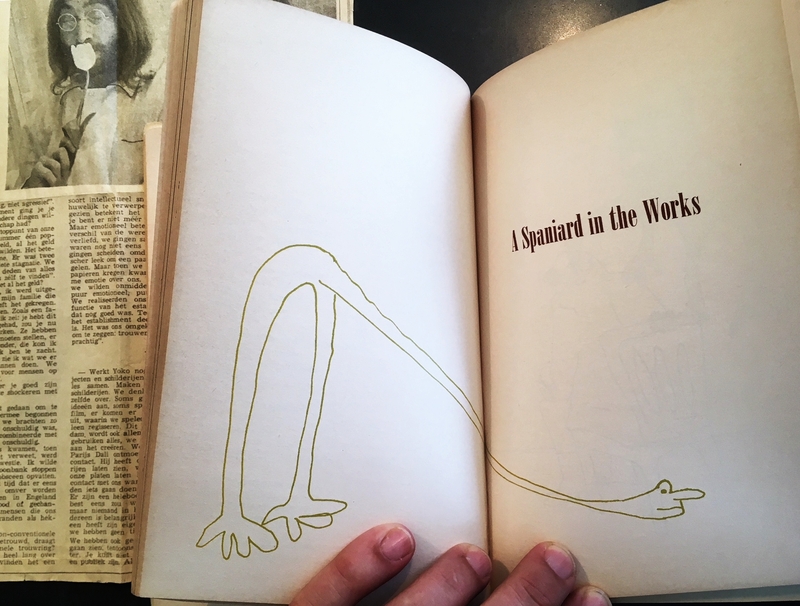 These pictures show how the drawing has been stapled into the book.